Choose from the famous line of Weber propane grills. Weber stainless steel propane grills feature stylish, heavy duty construction without costing a fortune. 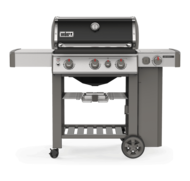 Select from models such as the Weber Genesis II E-310, Weber Genesis II SE-330 or stainless steel models such as the Weber Genesis II S-435 or, 4 burner models such as the Weber Summit S-470, or from the pinnacle line of 6 burner grills such as the Weber Summit S-670. 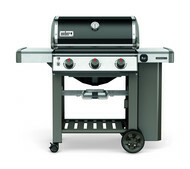 Most of these Weber propane grills are also available as Weber natural gas grills. 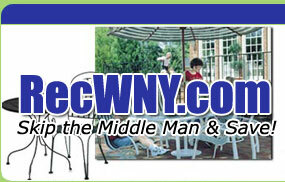 For customers living in Niagara County or Erie County, have your grill delivered and professionally assembled for $30. Please contact us for details. The super portable Weber Q 1200 gas grill looks modest on the outside but packs a surprisingly powerful wallop underneath its sleek exterior. Proof that good things do come in small packages. Weber set out to make the finest entry level grill on the market and that's exactly what they accomplished with this grill. The 26,500 BTU-per-hour input found on the Spirit II E-210 grill gives it plenty of oomph for cooking, while its warming rack and ample storage space makes it a joy to use. Weber has upped the ante in the entry level grill category with the Spirit II E-310 grill. 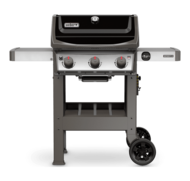 With more grilling space and 30,000 BTU's across three stainless steel burners the Spirit II E-310 grill out classes most every other grill in its price range. Weber quality and affordability makes the Spirit E-310 shine. Understated elegance with power to spare. Three stainless steel burners rated at 39,000 BTU's, an impressive 669 square inch total cooking area, and porcelain-enameled cast-iron cooking grates that serve double duty - they are excellent at holding heat and create wonderful sear marks. What's not to love about the Genesis II E-310 grill? Three stainless steel burners rated at 39,000 BTU's along with a side burner and Sear station burner make this a very impressive grill. What's not to love about the Genesis II E-330 grill? The Weber Genesis II SE-330 gas grill is the deluxe grill that will impress any grill buyer. This grill features all of the same great features of the Genesis II series with upgraded cooking grates and flavorizer bars. This awesome grill boasts three stainless steel burners and upgraded stainless steel grate and flavorizer bars. The Weber Genesis II LX S-340 gas grill is the ideal grill for for the person that wants to take backyard grilling to the next level. Featuring a redesigned look this deluxe grill offers the great quality that Weber is known for coupled with upgraded features. This spectacular grill boasts three stainless steel burners and heavy-duty stainless steel cooking grates. The Weber Genesis II E-410 gas grill is the perfect grill for the first time grill buyer. With a fresh new look and great style this grill gives you the great quality and heavy duty construction that Weber is known for, without costing you a fortune. This spectacular grill boasts four stainless steel burners that create up to 48,000 BTU's of heat. The Weber Genesis II SE-410 gas grill is the deluxe grill that will impress any grill buyer. This awesome grill boasts four stainless steel burners and upgraded stainless steel grate and flavorizer bars. The Weber Genesis II S-435 gas grill is the ideal grill for for the person that wants to take backyard grilling to the next level. This spectacular grill boasts four stainless steel burners and heavy-duty stainless steel cooking grates. The Weber Genesis II LX S-440 gas grill is the ideal grill for for the person that wants to take backyard grilling to the next level. 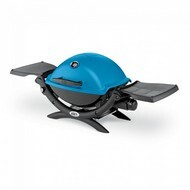 The Weber Genesis II E-610 gas grill is the perfect grill for the grill buyer that wants a little more in their grill. This spectacular grill boasts six stainless steel burners that create up to 60,000 BTU's of heat. With 538 square inches of primary cooking area. A flush-mounted, 12,000 BTU per hour input side burner. The Weber Summit S-420 is one extraordinary grill. 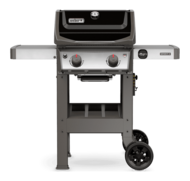 The Summit S-420 will transform an average backyard cookout into an unforgettable grilling experience. For those who want a grill with every option available without breaking the bank, the Summit S-470 is it. For starters the Summit S-470 possess a very large cooking area coupled with 4 stainless steel burners that supply more than enough cooking capability. And, if that isn't enough there is also a side burner, infrared rotisserie burner, smoker burner, and finally a searing burner - making this grill the definitive dream grill. With the larger size of the Summit S-670 grill you get a grilling system that offers all of the available options plus more space to grill with. The Summit S-670 offers an overwhelming 769 square inches of cooking space which is more than enough grilling area for even the largest of backyard gatherings. The Summit S-670 will allow you to become the entertaining king of your family and neighborhood.